Cut potatoes into 1/4-inch cubes. Transfer into a pot of cold water. Stir in salt and bring to a boil over high heat. Simmer over medium heat until cubes are tender but still hold their shape, about 15 minutes. Drain potatoes in a colander and set aside. Heat olive oil and butter in a skillet over medium heat. Add onion. Cook and stir until softened and translucent, about 5 minutes. Meanwhile, combine 1 teaspoon kosher salt, garam masala, cumin, coriander, turmeric, and cayenne in a small bowl for the spice mix. Add serrano pepper, garlic, ginger, and the spice mix to the onions. Cook and stir until mixture is well combined, about 2 minutes. Add peas; cook until heated through and slightly tender, about 3 minutes. Transfer mixture into a bowl with the potatoes. Add cilantro and lemon juice. Mix with a spatula until filling is well combined, with some potatoes partially mashed. Add more salt if needed. Combine cilantro, mint, green onions, serrano pepper, lime juice, and yogurt in a blender. Blend until smooth. Season with salt. Spread a few spoonfuls of the filling over one half of 1 tortilla. Fold in half. Repeat with remaining filling and tortillas. Heat oil in a skillet over medium heat. 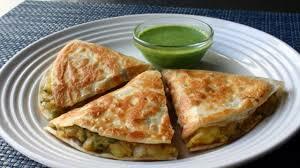 Cook each quesadilla until browned and crispy, 2 to 3 minutes per side. Transfer quesadilla onto your work surface and cut in thirds. Plate and serve at any temperature, alongside the chutney sauce.